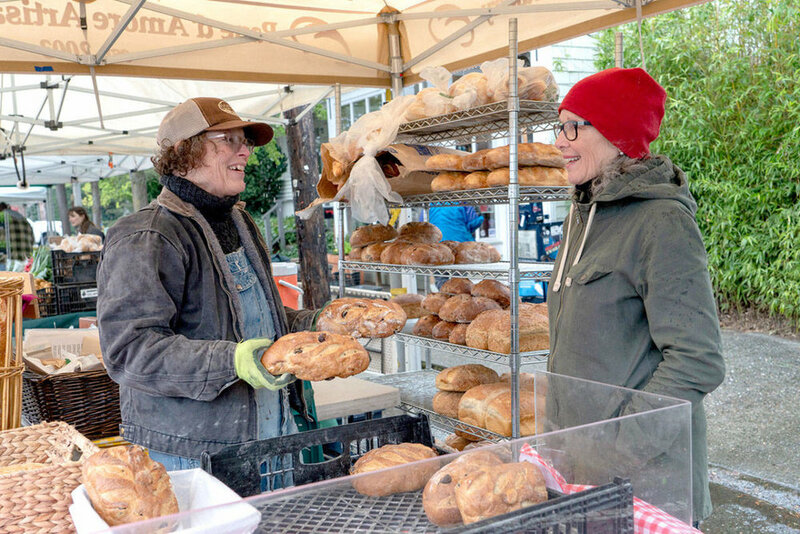 PORT TOWNSEND — Heather Hicks, left, and Linda Yakush, owner of Pane d’Amore bakery in uptown Port Townsend, prepare loaves of bread and sweet rolls for sale at the opening of the Port Townsend Farmers Market on Saturday. Inez Milholland playas in bubbles at the Port Townsend Wednesday Farmers Market. Photo by A Fare Story. Executive Chef Arran Stark of Jefferson Healthcare passed around chocolate flavored berries after his cooking demo. Leader photo. Farmers markets: Pulling up roots? PT Leader photo. Coraline Force eats a carrot at opening day. Karyn Williams, Red Dog Farm, harvesting tulips. Port Townsend Artisan Food Festival returns for a third year with classes, kombucha, music and more, taking place all day on Saturday, May 28. The Olympic Peninsula's first artisan creamery is celebrating its 10th anniversary of cheesemaking this year. The Port Townsend Saturday Farmers Market is number one on this list of state-wide markets. Port Townsend's farmers market is one of the larger, most popular ones in the whole state. Swing by and you'll find over 70+ vendors offering locally grown produce, artisan cheese, cider, baked goods, espresso, herbal salves, soaps and unique crafts, among other items. Aaron Stark at the Markets!